Rubber to metal bonded components. 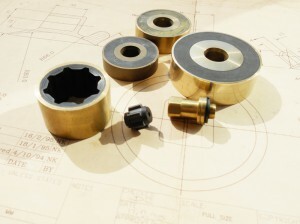 This can include Stainless Steel, Aluminium and Brass. Hauloff pads are a speciality and are produced in a wide variety of materials to suit customers requirements. We are happy to work with customer supplied metals or source them ourselves. Full range available, specially compounded and coloured if required to meet the specific application. 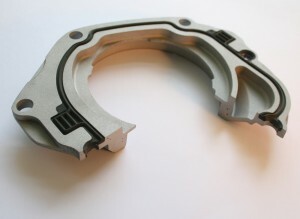 Techmould produced this rubber to metal bonded engine seal where the rubber is bonded in place. We have extensive expertise in rubber to metal bonding and general rubber mouldings for the automotive industry. Read more on our Automotive Rubber Mouldings here.